The passenger terminal complex at Suvarnabhumi Airport resulted from an International Competition and established the basis of collaboration between Werner Sobek, Matthias Schuler and Helmut Jahn. The challenge was great and unusual. 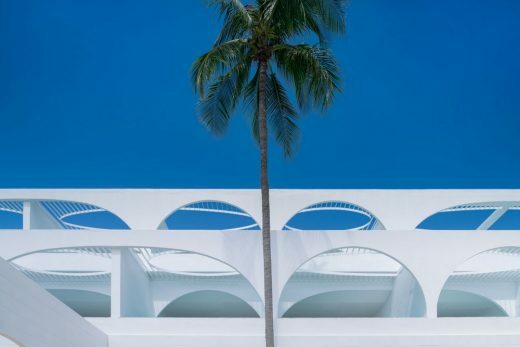 The task of creating a new gateway to Thailand in a tropical climate necessitated a different approach to architecture and engineering. Through the integration of the disciplines the complex problem resulted in a sophisticated, intelligent yet simple solution. After 11 years of planning and construction the Terminal is set to open for passenger traffic in late 2006. The design took into consideration Murphy/Jahn’s experience with airport terminal design, starting in the 1950’s. Those buildings included O’Hare International Airport in Chicago and particularly the New United Airlines Terminal of the mid 1980’s and the near completed renovation of Terminals 3 for American Airlines and Terminals 2, the work in the commercial zone of the New Munich Airport which included the Kempinski Hotel, the Munich Airport Center and Infrastructure, Parking and landscaped areas and the new Terminal 2 at the Airport in Cologne/Bonn. It also responded to the challenge that airports today are a New Building Type. They have become a strange combination of Transportation Center and ‘Mall’. They constitute cities outside cities and give the first and last impression of a city, region or country. They are places to meet for people of all facets of life. Architecturally important seem to us the openness and comprehension and experience of the open spaces, the gesture of the roof and spaces as memorable images and the way the blurring of the boundaries between public and private space make an airport terminal a model of a ‘Mini-City’. Like in a city the experience leads through squares, streets and rooms for transportation, commerce and private uses. In the design and execution of Suvarnabhumi Airport, innovative and integrated architectural, structural and environmental design were used, new materials and systems of advanced technology were developed and unusual construction processes required to meet the design goals. The results are advanced long span, lightweight steel structures, exposed pre-cast concrete structures, clear or low e-coated glass, a three layer translucent membrane, integrated cooling, using water as a low energy carrier and the thermal mass of concrete and a displacement ventilation system with minimal air-changes. Those components and parts serve in their total composition and in use more than in their conventional roles. They maximize daylight and comfort, yet minimize the use of energy with significant life cycle cost savings. The installed cooling power is reduced close to 50% compared to a conventional system. The three layer translucent membrane was developed to mediate between the exterior and interior conditions, dealing with heat and noise transmission, while still allowing for natural daylight within the building. The result is a building flooded with controlled daylight in a tropical climate. Architect and engineers speak here the same language, a process we refer to as Archi-Neering: the architect thinks about the technical consequences of the forms he designs and the engineers consider the aesthetic results of their concepts and decisions. In a building with such advanced technical concept and construct it is important to establish a connection to local cultural tradition and art. This is done through the shaded gardens flanking the terminal, which represent Thai landscape in cities and in the country, a jungle garden between the terminal and concourse, traditional artistic patterns and colors on glazed surfaces and floors and Thai artifacts placed at the airside centers and concourses. This combination makes Suvarnabhumi Airport Thailand’s own Gateway to the World. Associate Architect / Engineer: ACT Consultants. Baggage Consultant: BNP Associates, Inc.